KOAMTAC® announces the release of the new KDC20L-D and KDC350L-D-R2 1D CCD models. The newly implemented 1D CCD scan engine enables the KDC CCD models to read 1D barcodes from the LCD screens of smartphones, tablets, and PC monitors. KOAMTAC®, Inc. today announced the release of the CCD models of the KDC®20 Bluetooth barcode scanner and KDC350 wireless barcode scanner. The newly implemented 1D CCD scan engine enables KDC CCD models to read 1D barcodes from the screens of smartphones, tablets and PC monitors, as well as provide durability and a high degree of shock resistance. The KDC20 is a miniature Bluetooth barcode scanner equipped with a convenient swing-out USB connector, enabling consumers to conserve resources by eliminating cables and utilizing off-the-shelf multi-USB charging solutions. The KDC350 barcode scanner provides not only Bluetooth connectivity to a smartphone, tablet, or PC but also Wi-Fi connectivity to server. 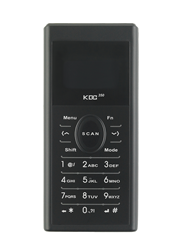 The KDC350 also supports Near Field Communication (NFC) and GPS. With an IP65-rating, OLED display, and 19-key alphanumeric keypad, it is one of the most unique and rugged products KOAMTAC has to offer. All KOAMTAC KDC models support Android, Apple iOS and Mac OS X, and Microsoft Windows XP/7/8/10 PC and Mobile 8/8.1/10 with auto Bluetooth reconnect capability for seamless data communication between the KDC and Smart device. A free KTSync® keyboard wedge application and SDK are also available for all operating systems. KDCs also come with a 1-year free trial of the KOAMTACON® application development tool that designs data collection applications in real time without the need for advanced programming and coding knowledge. iPhone, iPad, iPod Touch and Mac are registered trademarks or trademarks of Apple®, Inc., in the U.S. and/or other countries.